Listen to your heart. It usually tells you what you truly need (and even on what you should give up). Don’t let things which you can’t change anymore get you down. You can not change them anymore. But you can learn from them. Be brave and reach for the stars. You are worth it! And just say “no” from time to time. You are allowed to. Treat yourself every now and then. No matter if it is reasonable or not – your soul will thank you for it. Listen to your music. And do more of the stuff that you love. Just breathe… first because you actually need air and second because calm serenity often brings you further than short temper. And if the day still just does not turn out to be a good one… indulge in something delicious to eat! Because sometimes it is prepared easier than you might think. 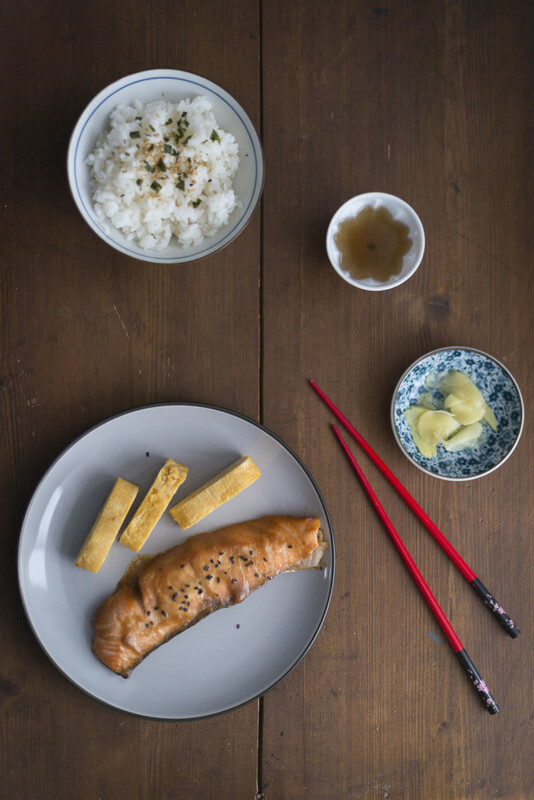 The salmon in miso paste almost cooks itself on its own in the oven, the rice cooker takes care of the rice, and you should always have gari at home anyway. To that some creamy eggs and a cup of heart-warming tea and everything looks a little brighter already. Wanna bet? Mix the miso, mirin, and sake in a dish. Turn the salmon in the marinade, cover the dish and let it rest in the fridge for 60-120 minutes. Preheat the oven to 200°C. Line a baking tray with baking paper and brush a little oil on it. Put the salmon onto the tray, skin side down, and bake for 12-15 minutes. Serve with freshly steamed rice and if you’d like some creamy eggs, some gari, and a cup of tea tea.